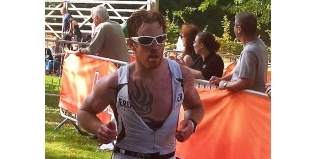 After his first ever DNF at Challenge Weymouth a couple of weeks ago, Tri247 columnist Karl Alexander was looking to bounce back on Sunday when he race The Gauntlet - part of the Hever Castle Triathlon. A race he knows well - he won it last year - he went into the race in good form and with motivation high. Here is his "mission accomplished" report. After the disappointment of Challenge Weymouth, I was keen to put in a good performance at The Gauntlet at Hever Castle - and as defending champion there was extra motivation. 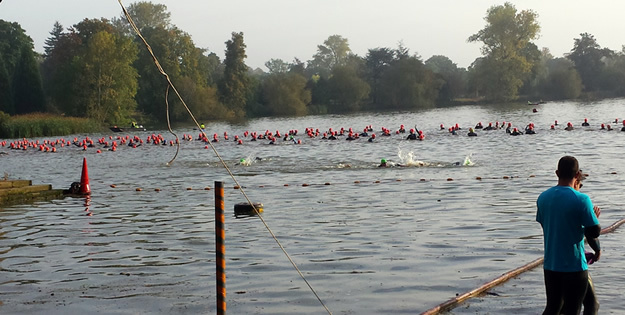 The Gauntlet is a half iron distance event held in the stunning surroundings of Hever Castle in Kent comprising a 1.9km lake/river swim, a 90km bike with 5,000ft of climbing and a 21km predominantly cross-country run. My build-up in the previous weeks had gone very well and I felt that I was hitting some good late season form. I had set a new 20 minute power best on the bike along with new PB's in the pool over 400 and 1500 meters. I certainly felt I would be competitive. The drive from High Wycombe at 5am took little over an hour and by 6:30 I was stood in transition racking my bike and looking forward to the day ahead. I was greeted by the Events Crew and asked to give a television interview which I'm becoming a bit of a dab hand at. I was racked next to Cat Jameson who was there racing her first middle distance event and last year's women's winner, fellow ERDINGER Alkoholfrei team mate Carol Bridge. As the 8:00am start time drew closer we were ushered to the lake and the pre-race brief. 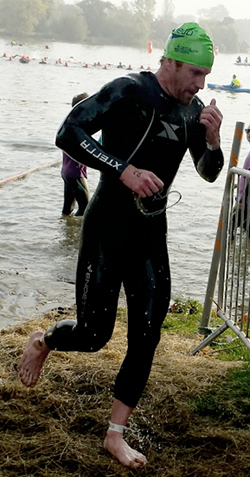 I spotted my XTERRA wetsuits team mate Craig Twigg and wondered over for a chat. As we spoke we learned the race would be delayed by 15 minutes to allow for the fog in Ashdown Forest to clear. Then it was on to the brief delivered by Race Director, Brian Adcock. I recall that last year the water was cold, really cold and with a little trepidation I plunged into the murky waters. Whilst it wasn't exactly a bath, the water temperature was fine. I positioned myself more or less in the centre and knew I would need a fast start. I targeted the second buoy as to where I would settle down and on the claxon we were off. Within 100 meters or so I was in clear water with a small group forming behind me. I was happy they were there as when I began to swim off course I was shouted at. I later learned that it was Dan Bigham that guided me back on course. Unfortunately this little detour had cost me and I was working hard trying to get back on the group. I left the water roughly four minutes down on the leader and had a lot to do on the bike if I wanted to defend my title. As I ran into T1 I dropped my goggles and as I slowed to pick them up I slipped over – typical as I was being filmed at the time!! On the first 'cheeky' hill of the course I started to catch a few of the faster swimmers and by the top I had overtaken quite a few people. I was now on my own in no man's land with the leaders ahead and no one behind and I had to settle into my tempo. I kept half an eye on my powermeter to make sure I wasn't going too hard and wasn't going to burn too many matches. With about 20km to go I was caught by two riders from behind, one of whom was really pushing hard and fighting to get away. I was feeling good and relaxed and was happy to lift my pace and go with his. As the lap drew to an end the Olympic distance course merged with ours (or we merged with theirs, depends on your point of view), and suddenly there was a lot of traffic to deal with - both cars and riders. At points the groups were really large and four people across. I gave up shouting ‘keep left' and got through as best as I could. Now in T2 in fifth position, I got my trainers and Garmin on and set off onto the run. The other cyclist that had come into T2 with me had a slightly slower transition but caught up on the climb. I was trying to keep it steady and let my legs ease into the run and after 3km I had distanced him and by 5km I couldn't see him. I felt I was moving well and covering the ground. 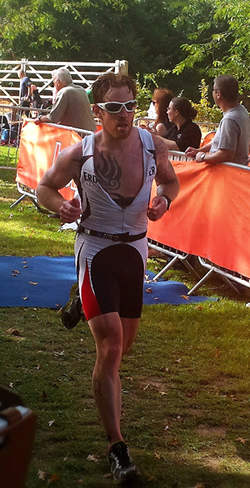 As I approached an aid station I was told I was in fifth place and about three minutes down on the athlete ahead. Once the course merged back with the Olympic course I found it a little better as I had a carrot dangling ahead and upped my pace. The rest of the run passed by fairly uneventfully and I crossed the line in eighth. Wait… What? Eighth? 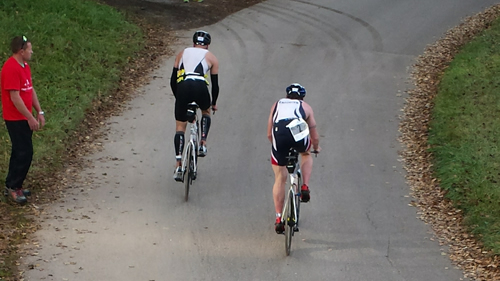 I was only overtaken twice on the run, both had pink numbers denoting they were in the Olympic distance race. How had I dropped to eighth? I later learned that several athletes had run the course wrong, where the course splits they had taken the wrong route and had run the shorter loop. As I write this I still don't know if I was fourth or fifth, my results initially had fourth. Either way I came into the event knowing that defending would be very hard but I felt I had a shout at a top five so in that sense it was mission accomplished. I have only one race left before I end my season. So now it's a few days rest and some gentle training.